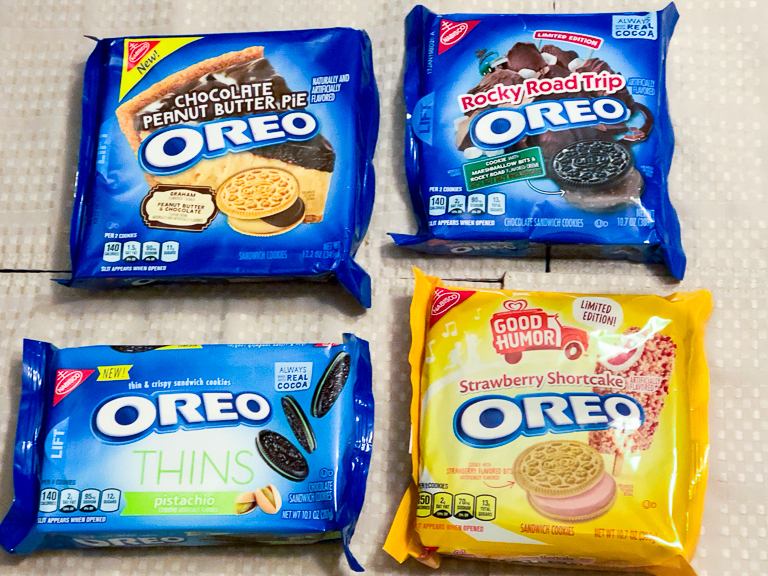 Didn't Oreo just release some new flavors for us to try? Yes, yes they did. Just 2 months ago in May they offered Cherry Cola, Kettle Corn, and Piña Colada flavored Oreos. 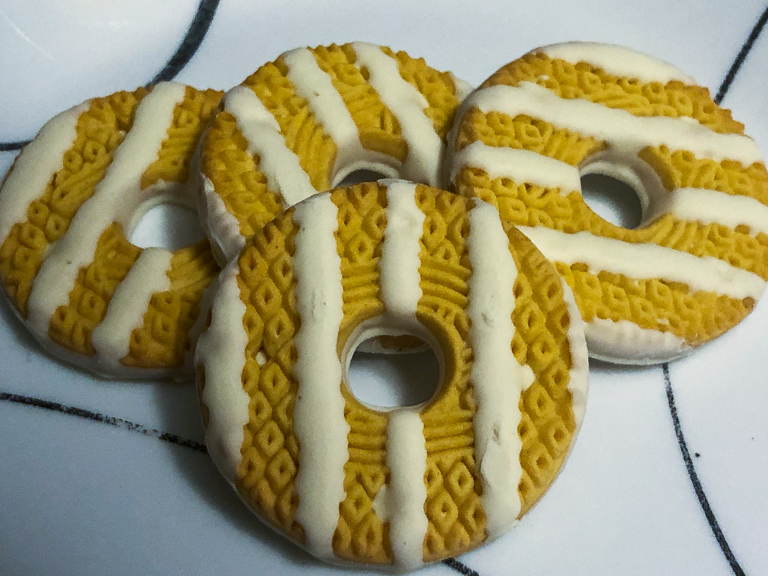 Despite that, the good folks at Nabisco released another 4 flavors in stores a short time later. Flavors like Chocolate Peanut Butter Pie, Rocky Road Trip, Pistachio, and Strawberry Shortcake. I had a hard time finding these where I live. Thankfully my brother is always looking out for me and bought and shipped me the flavors I couldn't find. Thanks! 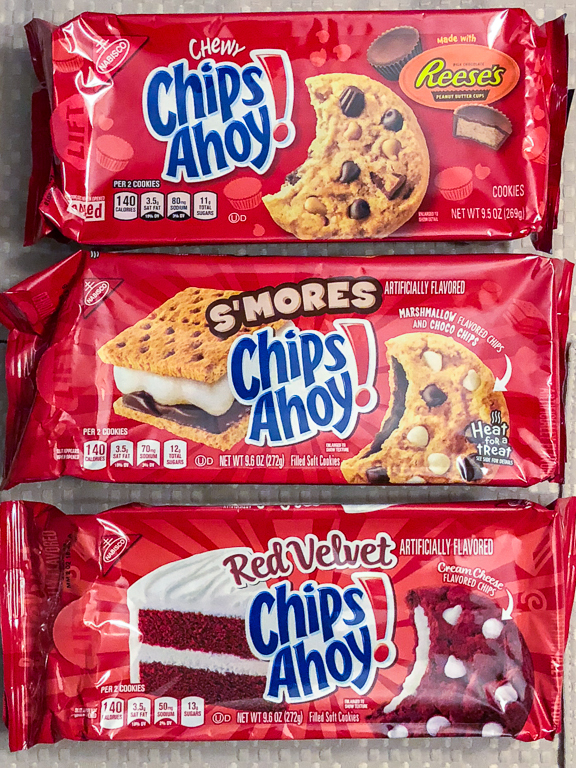 And not content to just stick to Oreo, Nabisco has also started throwing in new flavors of Chewy Chips Ahoy cookies. I saw more than this at the store, but today I'm starting with Reese's, S'mores, and Red Velvet. 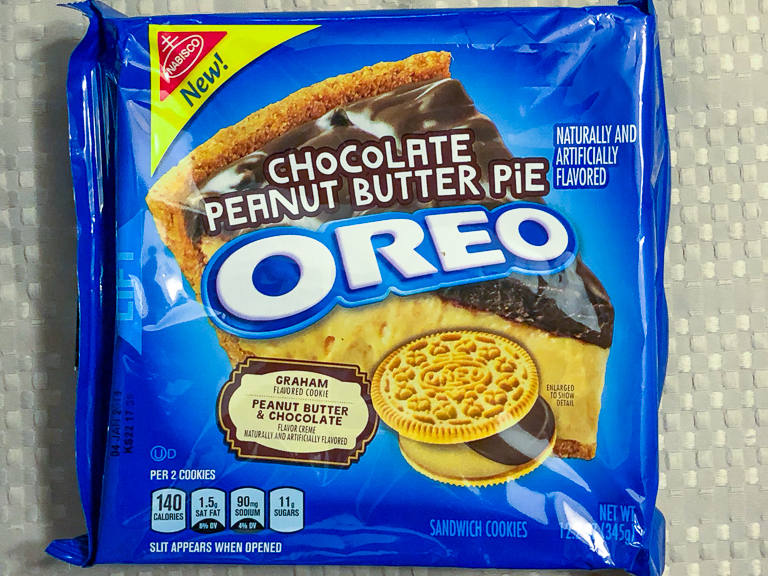 To start, let's try the Chocolate Peanut Butter Pie. Sounds delicious. 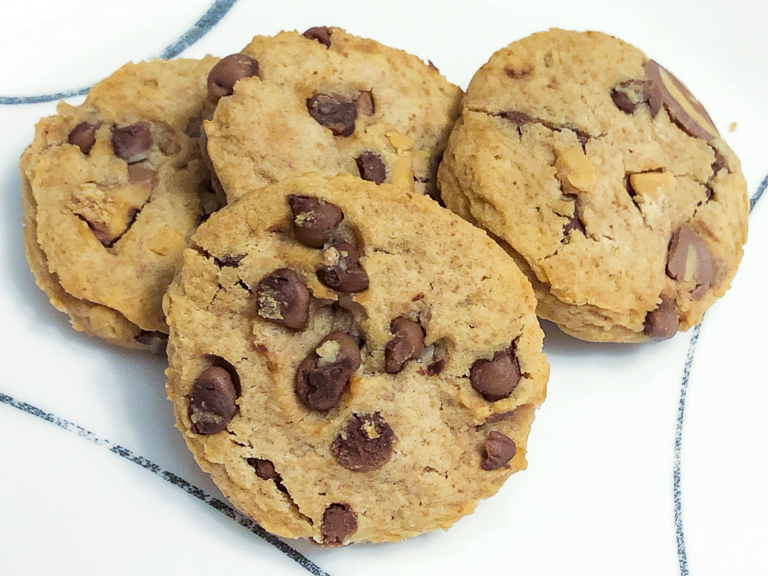 A Graham flavored cookie with chocolate and peanut butter filling. Between Jacob, Theresa, and myself, these were our favorite of the night. The peanut butter was fairly strong, and the chocolate was muted, but it tasted good never the less. Theresa thought it tasted like the Peanut Butter Sandwich Girl Scout cookies, which is definitely a good thing. 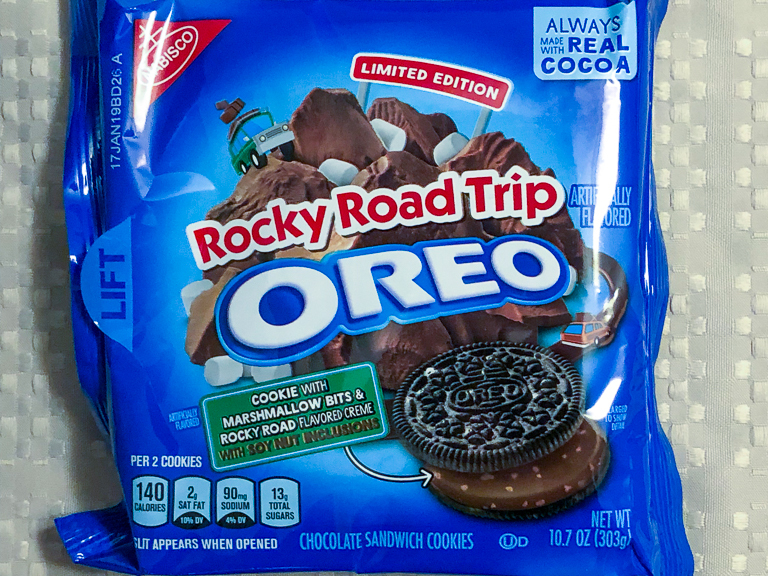 Keeping the chocolate theme going, next up is Rocky Road Trip. Obviously inspired by the ice cream flavor, inside the chocolate cookie are bits of marshmallow. Inside the rocky road filling are soy nuts (not almonds). Time to taste. 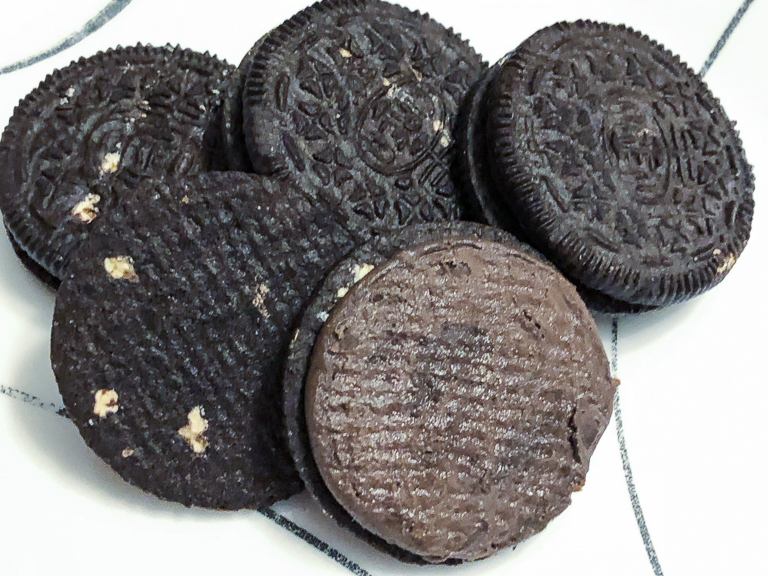 The cookies and creme tasted pretty much like chocolate Oreos. Then every once in a while you'd catch a bit of something. If it was chewy it was marshmallow. If it was crunchy it was soy nut. My third favorite. Next was Strawberry Shortcake. 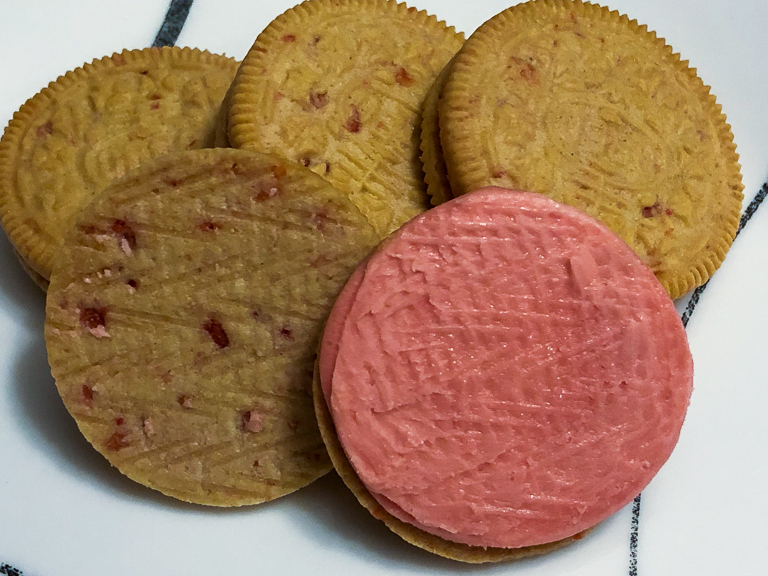 This cookie has bits of strawberry in the cookie with a strawberry flavored creme. My second favorite of the night. 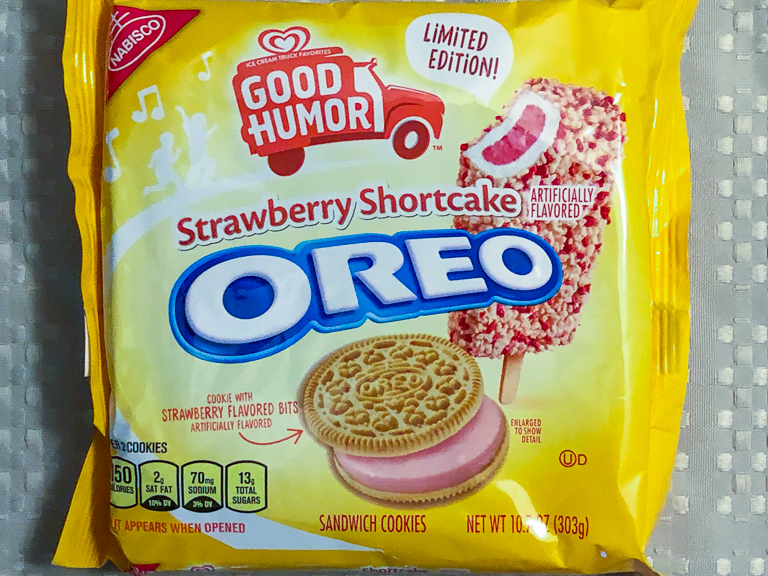 The overall strawberry flavor is definitely not natural strawberry flavor. It's completely artificial, like strawberry Nestle Quik, but I'm just fine with that. Yum! 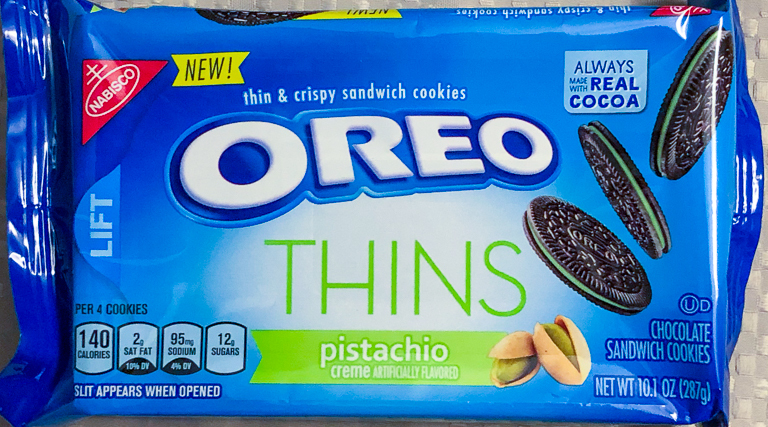 Lastly are the Pistachio flavored cookies. Upon tasting them, the three of us had a difficult time tasting Pistachio. When someone mentioned Almond extract, we all agreed. That's the flavor we were getting from these. My least favorite of the four. After all those Oreos, it was time to move on to the different flavors of Chips Ahoy! Let's get one thing straight. Chips Ahoy cookies aren't my favorite. Even the regular ones taste a bit chemically to me. Never-the-less, let's move ahead. First is S'mores. 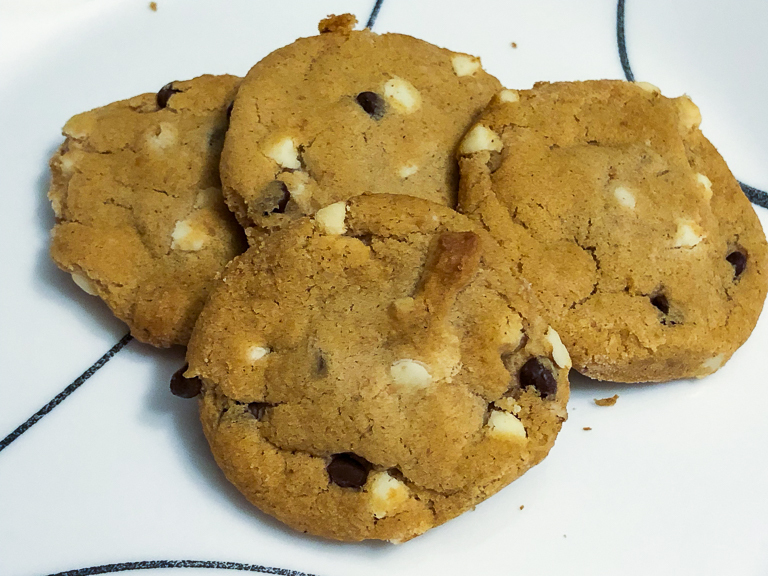 Marshmallow flavored chips, along with chocolate chips and a chocolate filling. Well, the chemical flavor is still there certainly. 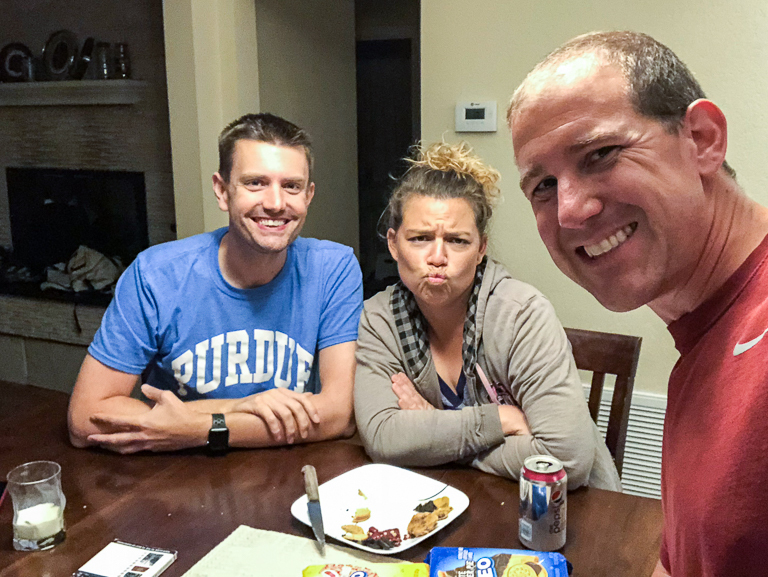 Jacob and Theresa thought they might have tasted cinnamon from the graham cracker, but I couldn't taste it. Instead of rating these highest to lowest, we'll just say if we liked them or not. Among the three of us, no one cared for this one. 0 for 1. Next up was Reese's. These I was looking forward to because Reese's cups are one of my favorite chocolate treats. Oh no. I don't like these. And I really can't point to why I don't like them either. Jacob checked the package to see if they were perhaps expired. Nope. They just don't taste very good. 0 for 2. 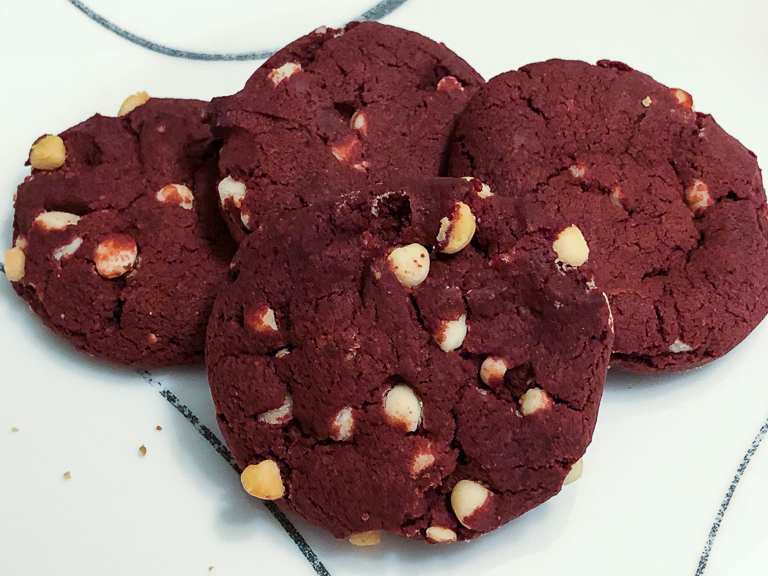 Lastly were the Red Velvet cookies with Cream Cheese flavored chips. An interesting idea. Out of all of them, I disliked this the least. Is that a compliment then? Call it 0.5 out of 3 then. 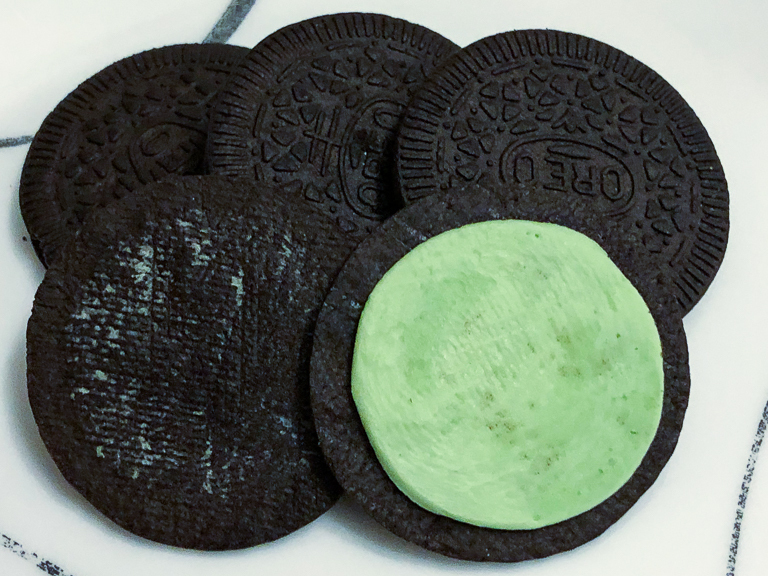 For the more calorie conscious, whole cookies just won't do. If they don't like it, they won't eat it. So obviously the Reese's and Red Velvet Chips Ahoy weren't favorites. It's cut into pieces, but there's quite a bit of S'mores left on that plate as well. For some reason the Rocky Road wasn't well liked. 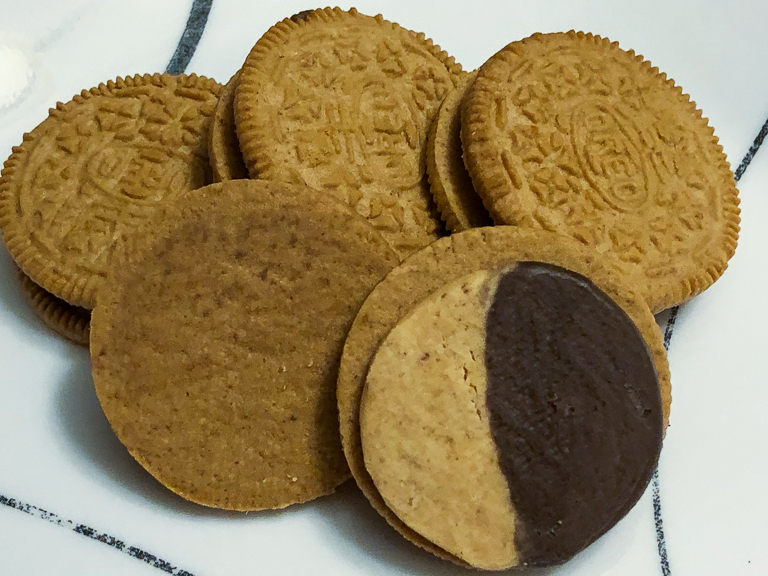 I snagged those extra pieces of Strawberry Oreos that were just hanging out. 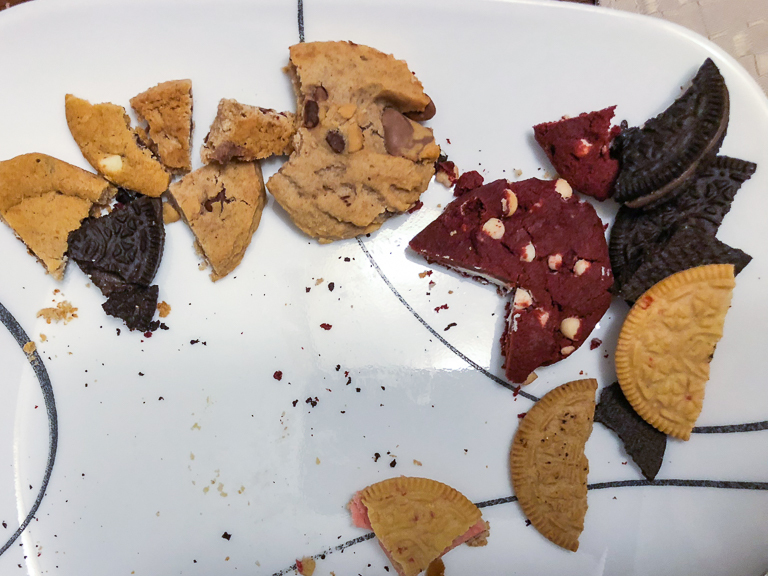 I didn't have any other flavors to compare these to, but since we're already tasting 7 kinds of cookie, what's one more? I love lemon flavored things, so I was looking forward to these. I suppose it's been a while since I've seen Ernie the Keebler Elf. He's lost weight. Yum! A very tasty lemon cookie. Well 8 cookies tested tonight. Three of them very tasty. And even though a lot of them weren't the best, it was still a lot of fun to taste them all.